If you have a day old bread lying around, turn it into this delicious and healthy salad. 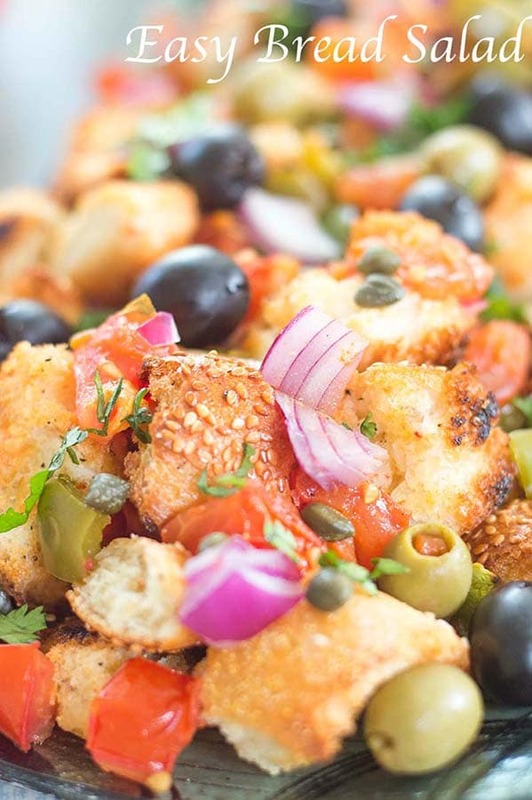 This is a simple bread salad perfect for lunch or as a side dish. So, I did what was only logical! 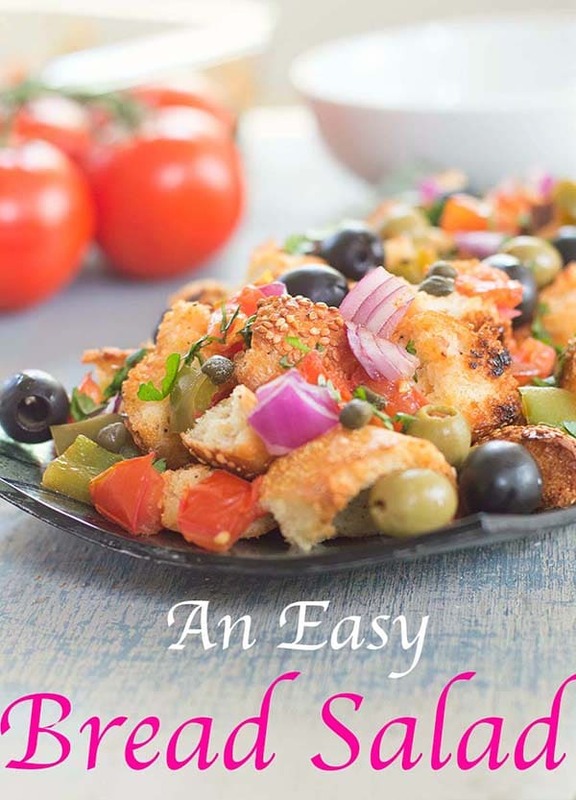 Life had handed me day-old bread and I turned it into a delicious Greek style simple bread salad. It turned out to be an absolutely perfect way to use the French bread. I couldn’t have asked for a better way to use up the bread. For this salad, I wanted there to be a little crunch from the bread. Crunchy bread is what makes this salad stand out. So, next time you have extra bread lying around, I suggest you don’t waste it by throwing it away or worse yet, turning it into croutons!!! 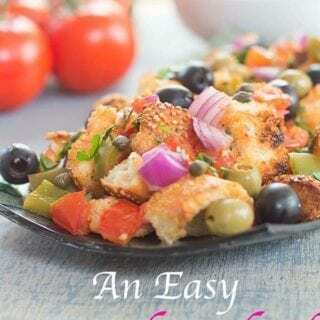 This simple bread salad is so easy to make and it only takes a few ingredients that you will probably have in your kitchen anyway. Don’t forget the extra garlic that my recipes are known to have. The olive were last minute addition. I went with black olives and manzanilla olives because they have a natural salty flavor. The red onions were added raw because I love the crunch they brought to the recipe. There is no cheese in this recipe because it is perfect without it. If you are inclined to choose some cheese, I have a vegan feta cheese that you can use in the recipe. 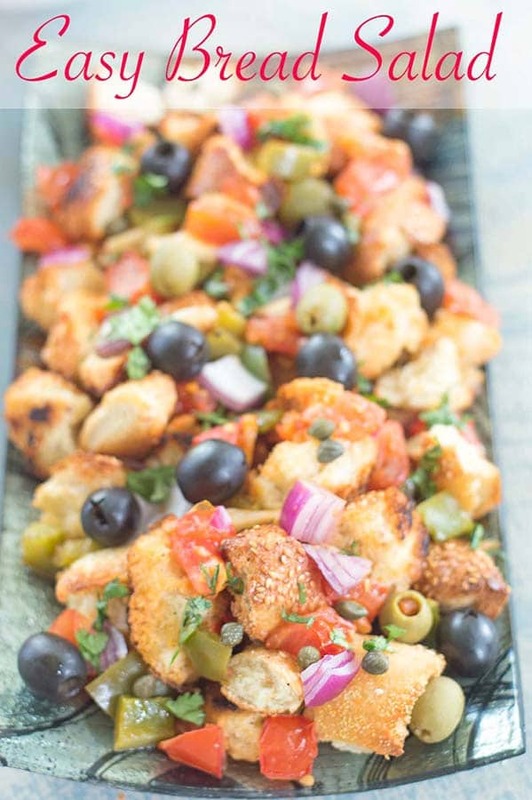 I refrain from calling this a panzanella salad because there are 2 things different from the traditional panzanella. I didn’t use stale bread and I didn’t soak the bread. Do you know a strange thing I did for this recipe? I bought these beautiful tomatoes on the vine with every intentions of putting them into this simple bread salad. I really did! But when I took them out of the bag, I couldn’t bring myself to cut into them!! 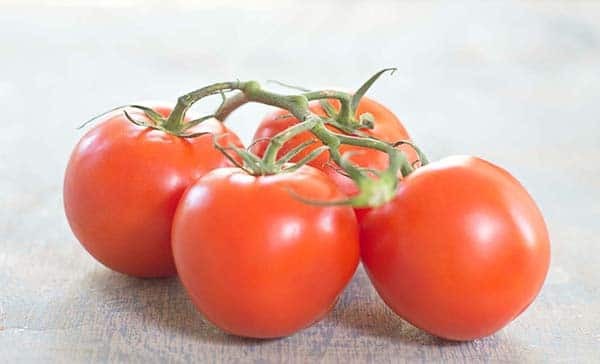 Would you cut into these PERFECT tomatoes? Look how pretty they are! I actually had to go back to the store and get other “not so pretty” tomatoes on the vine! Check out my ribollita recipe where I make use of tomatoes on the vine with bread. Its a delicious Tuscan bread soup. Note: Make this salad about 40 minutes before you are ready to serve it. 2) Take one long French bread that is about a day old. Make sure it has sesame seeds on it because it is delicious. Cut it into bite sized pieces. Place them in a large bowl and add 2 tsp of extra virgin olive oil. Add 1 tsp dried parsley to it and mix well. 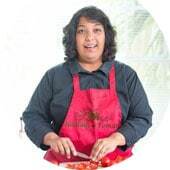 4) Cut 3 tomatoes on the vine into bite sized pieces. I used tomatoes that were not ripe just yet. Do the same for the green pepper. I used about 1/2 of a green bell pepper for this recipe. 8) Add 1/4 cup of black olives and a 1/4 cup of manzanilla olives to the bowl. Place the bread on a baking tray and put it in the oven. I love the addition of bread to this. It makes it more filling – salads always make me hungry after a little while. Love that you didnt soak it and left it crunchy, adds so much more texture to the salad. I love this idea. And the photos are stunning! The toasted bread looks like it has the perfect texture and crunch for a super satisfying salad! Love all the flavors you combined in this dish. I won’t be tossing any leftover bread for sure now! 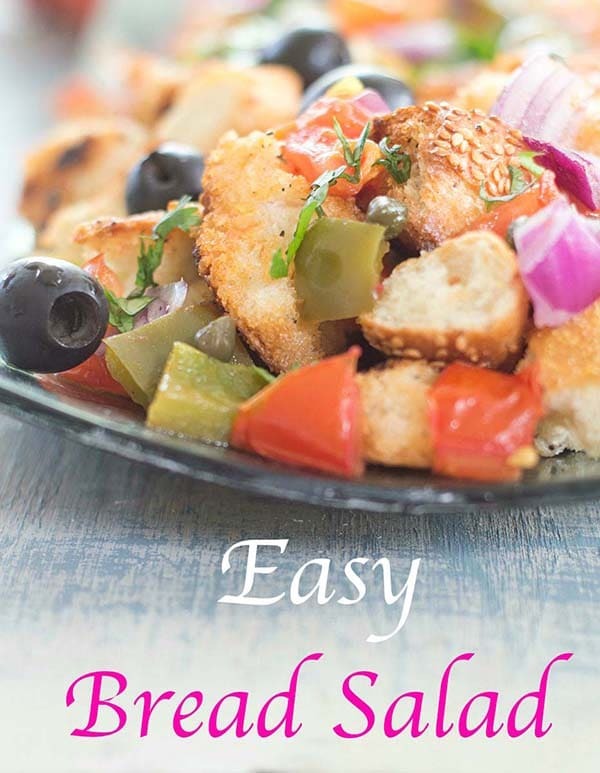 Bread salads are so delicious and the tip of using bread with the sesame seeds is a great way to add additional flavor, YUM! Your salad looks absolutely scrumptious and I would savor every bite! Thank you, Debra. I really like bread with sesame seeds because it has an added crunch.